Style your boyfriend jeans like this, and you'll look like a fashion pro! Thanks to the trendy boyfriend jeans, borrowing from the boys has never looked more chic! This soon-to-be closet staple is effortlessly fashionable when done right. So here, three ways you can sport a pair, without looking badly dressed. Wear your boyfriend jeans to the office by simply pairing it with a button-down top and oversized blazer in a bold color. Ditch the heels and go for leopard print slip-on sneakers instead, and take it back up a notch with statement earrings. Yes, you can totally wear your boyfriend jeans on a night out on the prowl with your besties. All you need is your fringe crop top, electric blue stilettos, and a totally cute cropped blazer you can take off when you want to. 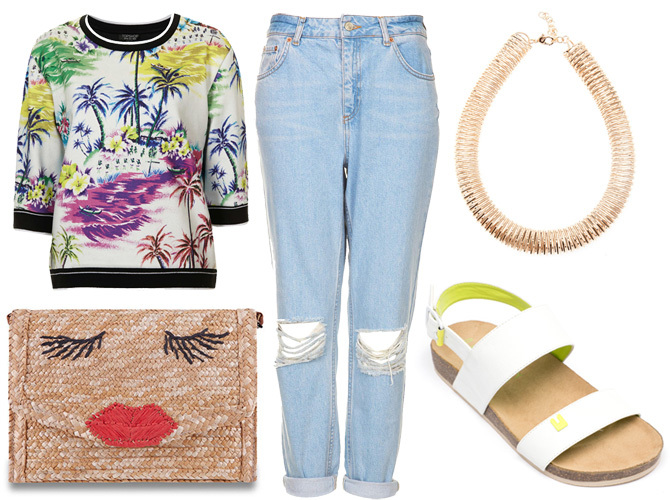 Weekends are for effortlessly trendy looks like your tropical tee, boyfriend jeans, and masculine sandals. Definitely the perfect outfit for your next #ootd.